LIMA — Ohioans have a choice between two “Robs” this November in the election of the next Ohio Treasurer. Both candidates — Rob Richardson, D-Cincinnati, and State Rep. Robert Sprague, R-Findlay — visited Lima this past week to talk to voters and establish some of their priorities for the treasurer’s office if elected. Sprague could be found at the Allen County Fair Wednesday evening hosted by the Allen County Republicans where he visited with voters and learned about local concerns. 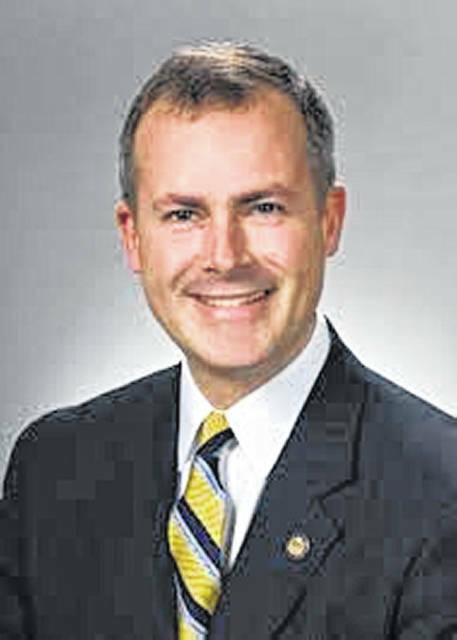 “When you go around the state, people are pleased with the wage growth in the state of Ohio and also with the economic growth and all the jobs that are being brought back to the state,” Sprague said. As a candidate for treasurer, Sprague pointed out the need for financial experience and highlighted his goals of creating fiscal responsibility, pushing for private innovation and improving transparency into how taxpayer’s funds are being used. Sprague is currently the state representative for Ohio House District 83. His experience includes working for the accounting firm Ernst & Young and serving as auditor and treasurer for the City of Findlay. He was appointed to the General Assembly in 2011. Sprague said he also would like to expand upon Ohio’s Online Checkbook. “I’d like to add to it so you got some analytical tools as a taxpayer, and you can go in and analyze how the state is paying your tax money and compare it against what other states do and other communities do,” he said. Sprague’s opponent, Rob Richardson, visited the training facility of UA Local 776 during a labor rally featuring Mayor David Berger and Rep. Jim Jordan’s Democratic opponent, Janet Garrett. Richardson called for using the treasurer’s office to hold other government officials accountable for how the state of Ohio spends tax dollars. As an example, Richardson pointed to the scandal surrounding Ohio’s online charter school, the Electronic Classroom of Tomorrow, which was found to be inflating its enrollment numbers to bring in more funds. It’s founder, Bill Lager, has been a political donor to state conservatives. “We’re going to bring back accountability to the state of Ohio because the state of Ohio deserves it,” Richardson said. Other issues Richardson said he would focus on include ending investment into for-profit prisons and holding employers accountable for sub-contractor clause abuses. Richardson ran for mayor of Cincinnati in 2017, and he currently works as a labor attorney with law firm Branstetter, Stranch & Jennings.